GeHang-VPI series vacuum-pressure impregnation plant are mainly used in varnish treatment of H-class dry-type transformers. They are suitable for coil varnish treatment of dry-type transformers with DuPont NOMEX paper insulation and dry-type transformers of the MORA company in Germany Production needs. At the same time can also be used for electric locomotive vehicle transformers, electrical products such as coil impregnation of electrical products and refractories bitumen treatment. 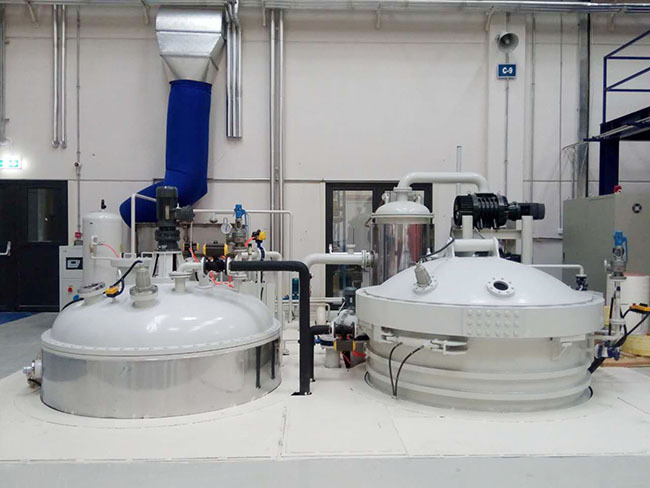 In a vacuum environment, firstly, the insulating paint is degassed, and then the insulating paint is transported to the impregnation chamber with the product to be impregnated through the pressure difference (the special insulating medium needs to be transported by the pump). Since the insulating paint can be sufficiently provided under the vacuum environment, Immersion into the product of the gap in the coil, and then in the immersion paint surface, the application of a certain pressure of air (or nitrogen), making the impregnation of insulating paint to further enhance the ability to greatly improve the strength of the coil insulation. Vacuum – pressure impregnation chamber lid hydraulic open, two mechanical protection, an electrical protection, making the vacuum and pressure in the case can not open the lid, to ensure the safety of the operation. chamber lining set a chamber for product placement and dipping paint, making the chamber itself is not in contact with the paint, keeping clean up, you can only lined tanks, easy to work, specially designed interface, as long as the liner into the dip tank, it can automatically docking and will not produce leakage. Between the dipping tank and the paint tank, one of the two paint pipelines is used one by one, with two filters of different functions to ensure the quality of the paint. According to the current domestic use of the type of paint, our company has normal temperature, cooling, heating different configurations to meet the needs of different customers, refrigeration (heating) can be carried out in the paint tank can also be carried on the pipeline. If the yield is large, two dip tanks per tank can be used, which not only increases production efficiency but also reduces investment. 1 .Vacuum- pressure immersion paint tank: the general use of vertical circular, the maximum pressure can withstand 0.6Mpa, opening the lid with manual and automatic two ways, according to the characteristics of the paint lined with stainless steel and carbon steel , tank with a level gauge, you can easily observe and control the transmission of paint . 2 ,Vacuum gas tank: The general use of vertical circular tank equipped with a level gauge and mixing device for vacuum degassing stirring tank , you can also easily observe and control the access to paint. According to the characteristics , there are divided into paint stainless steel and carbon steel , which can achieve heating and cooling. Explosion-proof pressure relief port on the tank. 3 ,Vacuum system: The main vacuum pump group, vacuum condensers, vacuum valves, pipes and other components. 5. Heating refrigeration system: At present, a little more refrigeration storage, the general use of industrial refrigeration , medium ethylene glycol solution, the temperature can be set according to the process. Heating with electric heater heating. 6. Hydraulic system: for the lid automatically open, a lid hydraulic cylinder, control valves, sensors and other components. 7 ,Pneumatic system: Compressed air source, air handling unit, control valve, pressure detection system, etc., for impregnation tank pressure and valve control. 9.Control system: for the control of the entire system operation, according to the level of automation equipment, direct control of the relay, PLC control and PLC+PC control, interlocking protection and interlocking of each action to avoid human error. PLC+PC control system can record all the details of the operation has been prepared to find. And set different operating rights to ensure the safety of equipment and products. 10. Other parts: According to customer requirements, you can configure other functions, such as the exhaust system for exhaust emissions and so on. 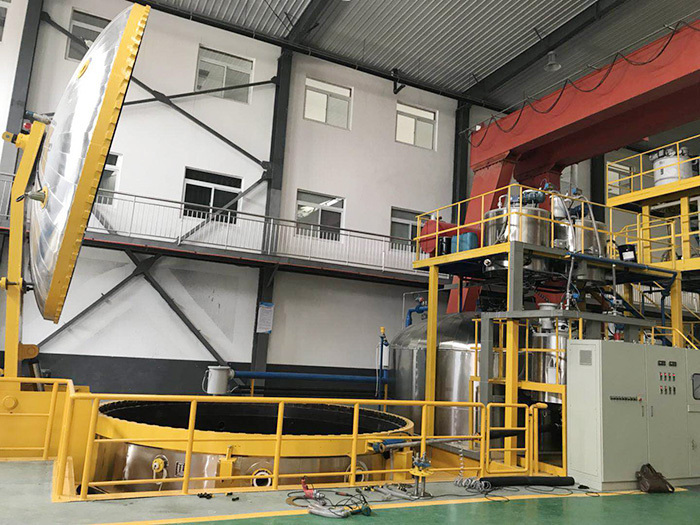 At present, our company according to the requirements of most customers, to determine the basic size of the vacuum drying tanks are as follows, if there are special requirements can be negotiated .